The care of the details of liturgy is an important one as it expresses our concern for the quality of our parish celebrations. 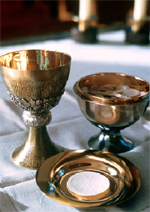 These detail included care for the sacred vessels (chalices, ciboria, altar linens, candles, candle holders and other sacramentals) we use to celebrated God's presence among us. Various persons are required to attend to these details and their assistance would be greatly appreciated. Contact person: Elin Peckham 905-639-9889.